Father Gerald Burkert, a retired priest of the Archdiocese of Indianapolis, died on May 13 at Franciscan Health Indianapolis. He was 83. The Mass of Christian Burial will be celebrated at 10:30 a.m. on May 18 at Sacred Heart of Jesus Church in Indianapolis, the church of the parish in which Father Burkert grew up. Visitation will take place before the Mass at Sacred Heart from 9:30-10:30 a.m.
Archbishop Charles C. Thompson will be the principal celebrant of the Mass. Burial will follow at the priests’ circle at Calvary Cemetery in Indianapolis. Ordained in 1961, Father Burkert was longtime co-pastor of St. Jude Parish in Indianapolis, and pastor of Holy Family Parish in New Albany and Holy Name of Jesus Parish in Beech Grove before his retirement in 2007. Father Robert Robeson, Holy Name’s current pastor, visited him several times at the St. Paul Hermitage in Beech Grove where Father Burkert lived in retirement. He appreciated the retired priest’s gentle leadership of Holy Name from 1996-2007. Father Robeson said that Father Burkert’s main regret in his later years was that he was unable to help priests in parishes. A stroke he suffered months after retiring left him unable to drive to parishes across central and southern Indiana. In a 2011 interview with The Criterion on the occasion of the 50th anniversary of his ordination as a priest, Father Burkert said that celebrating the sacraments, especially the Mass and the sacrament of penance, continued to be powerful moments for him decades into his priestly life and ministry. Therese Brandon worked closely with Father Burkert at Holy Name, serving on its parish council and school commission while he was pastor there. Father Burkert often spearheaded building projects in the parishes he led. At Holy Name, he led a capital campaign that resulted in the building of a gymnasium and parish office building, the latter of which is now named after him. But while Father Burkert leaves a brick and mortar legacy in the parishes where he ministered, Brandon also sees a lasting effect in how he helped build a community of faith among the parishioners at Holy Name. Gerald Franklin Burkert was born on May 3, 1935, in Indianapolis to Michael and Ruth Burkert. He became an archdiocesan seminarian after graduating from the eighth grade at the former Sacred Heart of Jesus School in Indianapolis and received priestly formation from 1949‑61 at Saint Meinrad Seminary and School of Theology in St. Meinrad. Father Burkert was ordained a priest on May 7, 1961, by Archbishop Paul C. Schulte at the Archabbey Church of Our Lady of Einsiedeln in St. Meinrad. His first pastoral assignment was as associate pastor of St. Patrick Parish in Indianapolis. He served there for a year and then ministered as associate pastor of St. Jude Parish in Indianapolis from 1962-69. During that time, he also served as a high school teacher at the former Chartrand High School in Indianapolis, which later became Roncalli High School. From 1969-71, Father Burkert ministered as associate pastor of St. Mary Parish in New Albany. He then returned to St. Jude Parish, serving with Father William Morley, who died in 1985, as its co-pastor from 1971-83. 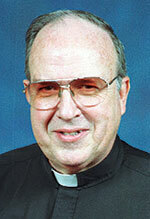 Father Burkert then returned to New Albany, ministering as pastor of Holy Family Parish from 1983-96. His last pastoral assignment was as pastor of Holy Name of Jesus Parish in Beech Grove, serving there from 1996 until his retirement in 2007.